That lets you know exactly where Wildcats stand with their team this year. Coming off their first bowl in five years, there’s an air of hope…an air of optimism. August is always the most optimistic month of the football season anyway because everyone is undefeated. Cat fans are falling in line with most fan bases this time of year and talking themselves into an extra win or two. Things are different in Louisville, but I’m not even sure in what way. Card fans don’t quite know how to feel about this football team. They are ranked sixteenth in the AP pre-season poll. That’s actually the fifth highest they’ve ever been ranked in that poll, but it doesn’t feel like an air of optimism. The overwhelming vibe I get from fans is an odd one: Restraint. From the moment Lamar Jackson and the Cards destroyed Florida State in front of College Game Day and a national audience, there was a new target: the college football playoff. There was no restraint for most of last football season. 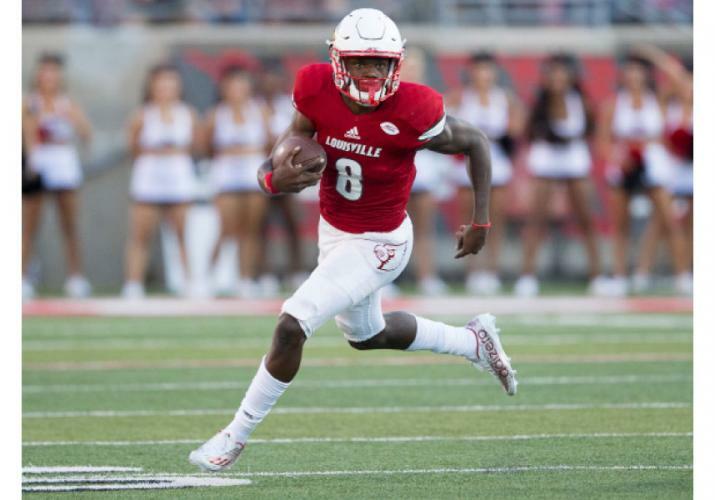 From the moment Lamar Jackson and the Cards destroyed Florida State in front of College Game Day and a national audience, there was a new target: the college football playoff. Cards fans focused so much on how to get into the top four of the rankings, they forgot to talk about basketball. Every point of conversation into November last year was about football. From call-in shows, social media, water cooler talk, to any bar or restaurant you went into, the question was the same: Can U of L get into the playoff? Then the bottom fell out. Three straight losses to end the season, and the question was: What just happened? Between the end of the season, and the start of this one, you’ve also had an NCAA punishment, an appeal of that punishment, controversy with the U of L Foundation, and a confrontational tone to a new YUM! Center lease. Which brings us to the restrained vibe for this football season. Maybe those other negative events have made Cards fans feel guilty about being optimistic. Maybe being so close to the playoff last year has them once-bitten twice-shy. There is plenty to be excited about. It starts with most exciting returning player the program has ever had in Heisman trophy winner Lamar Jackson. (By the way, Penn State, Oklahoma state, and Oregon are big names among a list of 22 schools to have one Heisman trophy winner). It continues with a schedule that should see them favored in 10 of 12 games. ESPN radio has already selected Louisville and Clemson to be their anchor site for College Game Day in week three. No one knows until December if optimism or pessimism is justified. But it seems to me that Louisville fans should share in the blissful ignorance of not knowing what lies ahead in this college football season. So, Cards fans, bust out the grills and the corn hole boards and join the party that is pre-season hype. We have plenty of time to deal with reality when the games start.